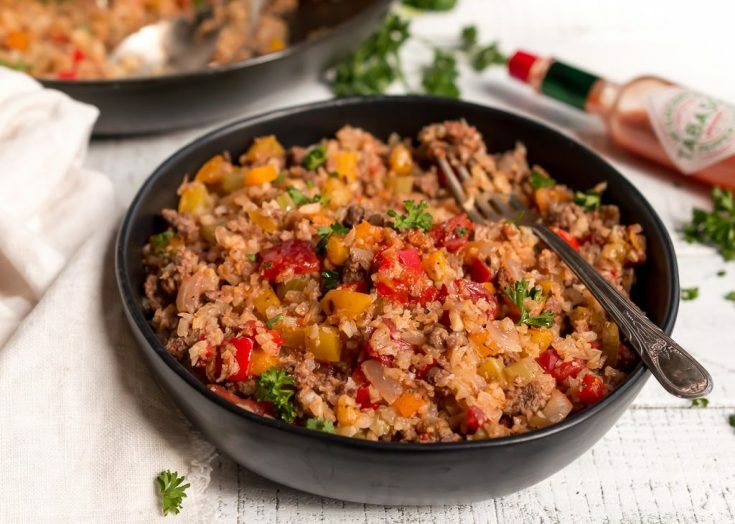 Just in time for Mardi Gras, this Cajun Dirty Rice Recipe has all that great New Orleans flavor while packing a ton of nutritious vegetables! 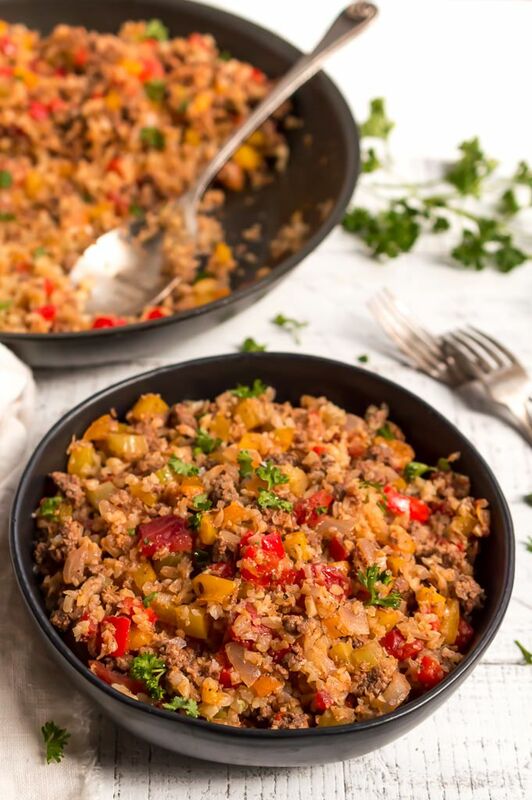 This cajun rice is Gluten Free, Grain Free, Dairy Free, Whole30 and Paleo compliant. Perfect for enjoying Mardi Gras food in a healthier way. Cauliflower rice has always been a bit underwhelming for me. I just couldn’t get into it. But, I kept trying and discovered the trick. Cauli-rice needs to be pan fried super hot to get brown and toasted. 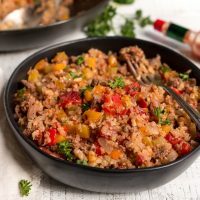 This Cajun Dirty Rice Recipe has all the usual suspects (minus chicken livers) and that great toasty cauliflower rice. The best part (besides the flavor) is how quick and easy this is to make. And because it has ground beef, this could be a main meal or side dish. 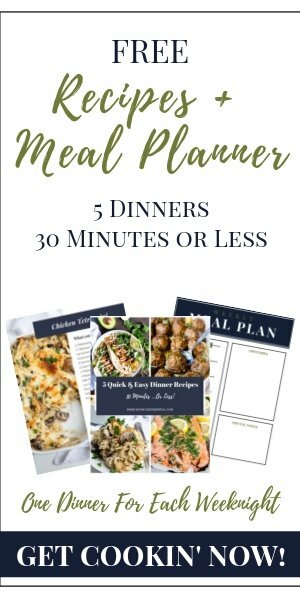 The leftovers are great too, so this could work for meal prep. My Mom and I are going to New Orleans in May. We used to vacation there every year before I had my daughter and this will be our first time back after 9 long years. If you have never experienced New Orleans, you should definitely add it to you bucket list. The flavors, the sounds, the smells and the people are truly unique to the city. There is no other place like it on this earth. We eat, drink and watch drunk people all day. And then by evening I AM one of those drunk people ???? My poor mother holding me by the waist while we stagger down Bourbon Street towards our hotel. If you want to follow along with my New Orleans shenanigans, I’ll be posting lots of food and drink pics on the WonkyWonderful Instagram. Hopefully I don’t post any midnight live videos! 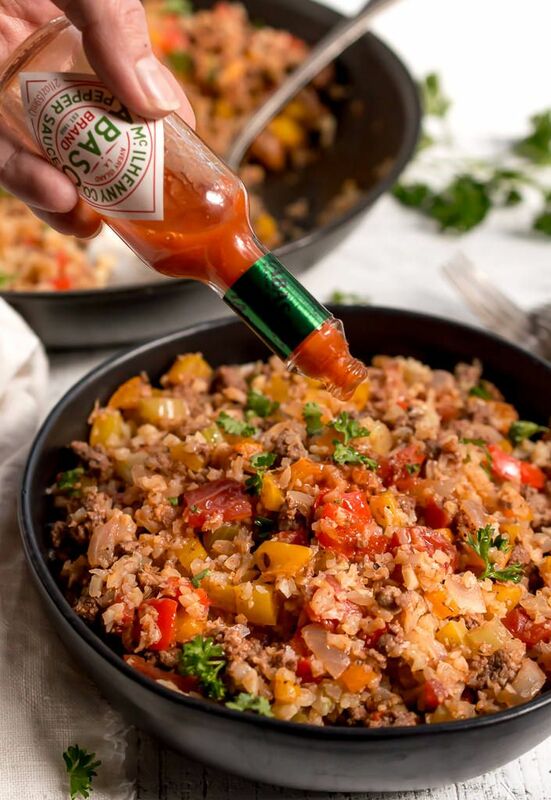 Until we get there we will have to make our own New Orleans inspired recipes like this Cajun Dirty Rice. And the good part about making it at home is that we can healthy it up a bit. Just don’t expect to find much healthy fair in the French Quarter. That’s all fried, drenched, buttered or slathered . . . when in Rome, or in that case New Orleans! 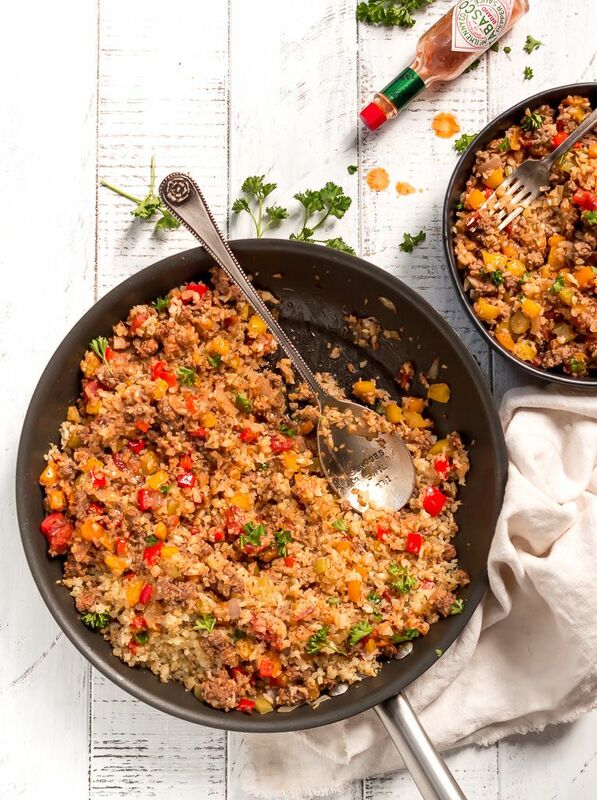 Cook the cauliflower rice in a super hot pan to get that golden toasted deliciousness. Cauliflower rice needs to be cooked in two batches in order to get browned. Second batch may cook a bit faster because the pan is fully heated. Drain the meat after cooking, if necessary. I find that good quality grass-fed beef doesn’t usually require this step. Cheat! Cheat! Cheat! 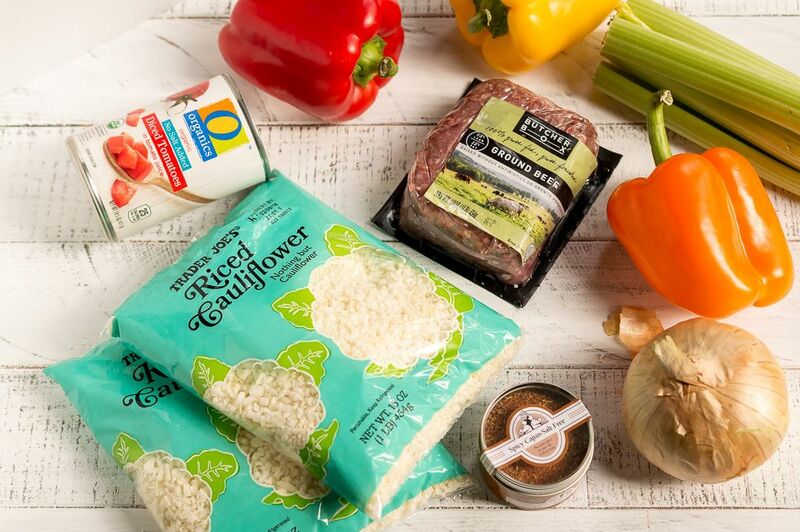 Buy pre-riced cauliflower and pre-chopped veggies. This will save you loads of time. Omit the beef and use oil instead of ghee to make this a vegan dish. Cauliflower rice needs to be cooked in two batches in order to get browned. Preheat large pan over medium/high heat. Melt 1 Tb ghee and add half the cauli-rice. Cook for 5 minutes then stir. Cook and stir for approximately 5 more minutes or until browned. Set aside and repeat process with remaining ghee and cauli-rice. Set aside. Add beef to pan and break apart. (Use a potato masher to get small ground beef crumbles) Once beef is broken apart add the onion, peppers and celery. Cook for 10-15 minutes or until peppers are tender. Drain off grease if necessary. Add diced tomatoes and cajun spice to pan. Cook 2 minutes, turn off heat, return cauli-rice to pan and stir until combined. Add salt and pepper to taste. This is going to need a generous amount of salt. Serve with hot sauce. What would be good substitutes for the cajun seasonings? You could do your own blend with garlic powder, paprika, cayenne, thyme, onion powder, salt and pepper. I’ve substituted cauliflower for rice in rice dressing, it’s good, minus the tomatoes because we Cajuns don’t put chopped tomatoes in rice dressing. The best dish!! I added Slap Ya Mama seasoning. I slid in some extra salt for me, as suggested. For those with a super busy lifestyle, I used a 3 Pepper and Onion Blend from the frozen food section. After my garden yields the bell peppers, I’ll add. Thanks for the share.